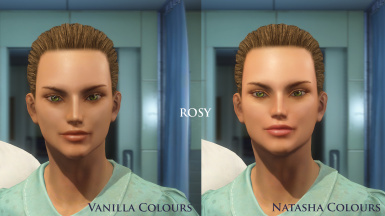 A complexion replacer for your female sole survivor. If you have previously used my work with my permission, you must contact me if you want to accept donation points for that mod. A younger, fresher-looking complexion for your female Soul Survivor. Be beautiful without a stitch of make-up or pile it on. She'll look great either way! 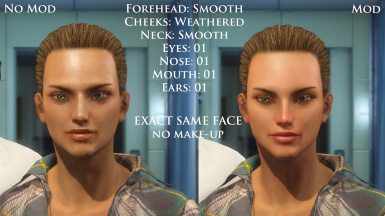 To get the complete look in character creation, choose "smooth" for forehead and neck, "weathered" for cheeks and the number 01 option for eyes, nose and mouth. This mod is not supposed to "compete" with Valkyr. I love Fuse's textures which is why I made them compatible. I just like to make face texture mods and I like more choice. If you're switching from Valkyr to this on an existing character, you'll probably notice her nose suddenly looks bigger. This is due to Fuse's textures giving the character what I call a normal map "nose job", which is something I do in some of my own textures for other games but not here because Fallout 4 already lets you make incredibly thin noses). Just visit the surgeon or use SLM 14 to slimmify the tip and you might also want to lower the bridge to get the same look back. PLEASE DON'T FORGET TO ENDORSE if you like this mod! Update 17 May 16 - "Vanilla Colours" version added per request. See images for comparison shots. Update 18 May 16 - Added a LooksMenu Preset. You can get that mod here. It requires F4SE which is linked on that page. Until Face Ripper is up and running, I have no way to create a preset the usual way. This complexion significantly alters the colour of the skin. 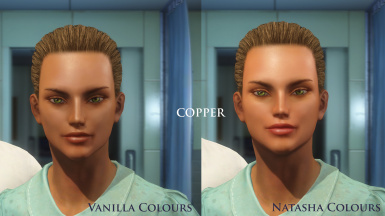 If you have a character that already uses the smooth options, you will probably want to visit the surgeon to change your skin tone. Vanilla Piper will remain unchanged as she doesn't actually use the textures named after her. 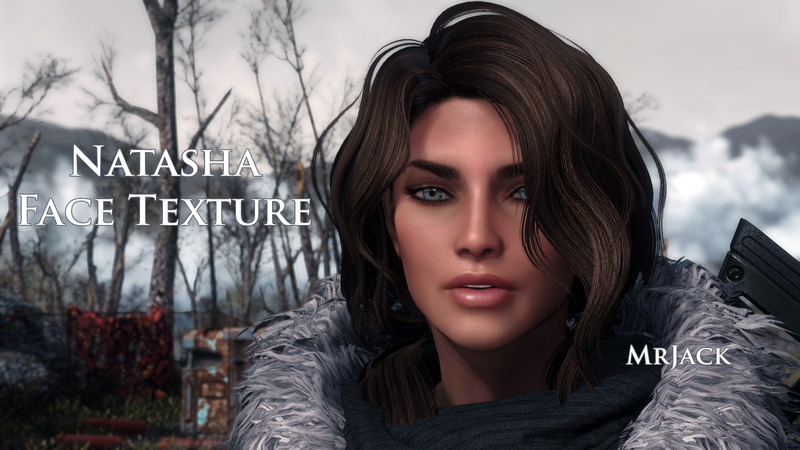 This mod IS compatible with mods that alter the basefemalehead_*.dds files such as Valkyr Face Texture. You can use both at the same time. In fact, I tried to make the colouring of my textures similar so they can blend together if you decide to use both options for different parts of the face. The results may vary but using any of the vanilla textures on the face will almost certainly look bad due to the colour mis-match. I included an esp as the main file so that if the "Piper" textures are ever referenced directly in game by another character, it will still use them. If you'd rather just replace the textures, you can download the non-esp version.